Really enjoying how the Matias Quiet switches in this compact keyboard sound and feel. My previous keyboard had Cherry Blacks so these quiet tactile ones make typing a lot easier (for me). This is an update to my previous review. First, the situation has improved regarding replacement keycaps. 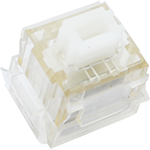 Although I enjoy sourcing dye-sublimated PBT and doubleshot ABS Alps-mount keycaps from vintage keyboards, it is possible to buy new ABS sets from MK, Massdrop, and Matias. 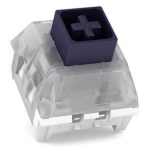 Second, the V60 Matias-switch keyboards now being sold can be installed in aftermarket cases for 60% keyboards. 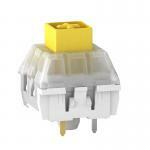 I think that 3 out of the 6 mounting points can be used, which is sufficient to hold the keyboard in place. Given these new developments, I would increase my rating to 5/5 stars. So now Im back with the year review, I honestly dont remember exactly how long I've had this keyboard now but for more than a year for sure. Anyways, this keyboard is still holding up fantastic, got some real good build construction on it. Even after all this time, still clicky and loud as hell. An amazing keyboard, and a mustve had in a collection of Mkeyboard switches. The ONLY downside to this board, is how damn hard it is to find replacement caps its near impossible for me. Luckily I caught onto a Massdrop for Doubleshot Caps and it was a good price of $25 USD. Matias still have yet to do their PBT caps, starting to doubt they ever will but the Doubleshots are plenty enough for me and theyre just beautiful. All in all, 5/5 in my opinon but overall 4/5 simply because how hard it is to find replacement caps but you if you dig enough or get lucky with Massdrop, you'll find a nice set of Doubleshots. An update to my previous review - after facing issues on both of my v60s with duplicated keypresses, I was able to resolve the issue by opening up the keyboard and resoldering the affected keys. Over time, stresses on the circuit board combined with a minimal amount of solder used and a likely cold joint caused a hairline crack, which caused the key to sometimes disconnect and reconnect as it was pressed. Reflowing the solder (and adding a bit more) seems to have solved the issue. I just typed this review out on the "worst offender" and had zero repeated keystrokes. I own two of this keyboard, both of which are fantastic. One of them experiences the chatter issue (not bought from MK), even with the updated firmware, and one works fine. The chatter issue isn't constant, but it is annoying. Ended up getting a V80 to replace the V60 with the chatter issue. Finally - A quiet mechanical (without o ring things) that feels great. My kids are very sensitive to noise and can't deal with clacking. This is perfect. Just received today, excellent packing, outside box was a bit crushed, but the KB Paradise box inside was fine. A couple of minor cons. The keypuller broke on its first use (cheaply made plastic?) I have seen a couple of instances of chatter mentioned previously. Overall would give it a 3.75, so I will round up to a 4. Thank you MK. I love this keyboard for the layout, the DIP switch options, and the Matias switches. However, the board frequently experiences key chatter (duplicated key presses) even after installing the manufacturer's firmware update. The same problem occurred both in the board I originally purchased, and the one that replaced it. Given the apparent QA issues, the keyboard might be okay for light use and casual gaming, but I couldn't recommend it to anyone as a work keyboard. Despite the problems with the keyboard, I do want to give a shout-out to MK's customer service. They've been very quick and helpful, and I had no trouble replacing the board. I have the V60 Matias Click and Matias Quiet Click keyboards. Both are excellent with superb tactile feedback. Although I favor the Click model because I like aural as well as tactile feedback, when I am typing within earshot of others I can switch to the Quiet model. The Quiet Click is indeed quiet. It is even quieter than my Type-S HHKB Pro 2. Highly recommended! The keyboard itself gets 5/5, but because of the relative lack of replacement keycaps, I give it a 4/5. 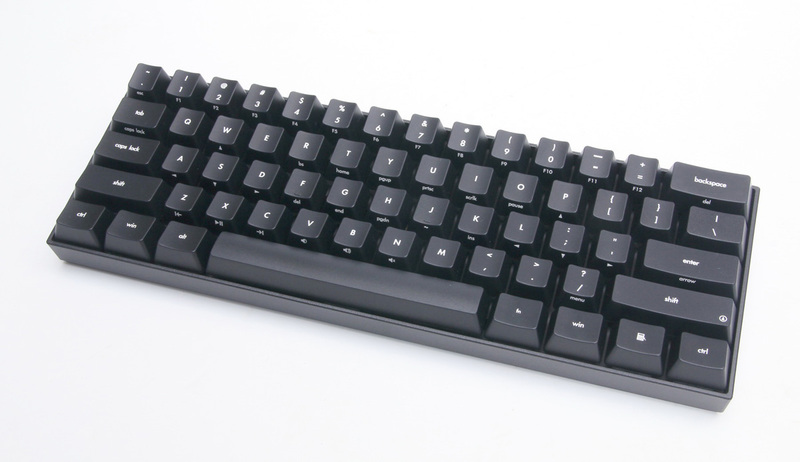 The KBP V60MTS-C and V60MTS-Q are excellent keyboards that offer Matias Click or Matias Quiet Click switches in a 60% form factor keyboard with a standard layout. 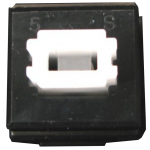 DIP switches provide layout options, and in combination with Karabiner or other remapping software, it is easy to configure the keyboard to various layouts, including Mac/HHKB. Typing on either the V60MTS-C or the V60 MTS-Q is a pleasure. 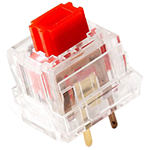 I much prefer either Matias switch to any Cherry mx switch (including red, black, brown, clear, blue, and green). 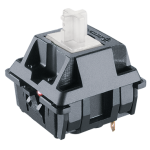 The Matias Click and Matias Quiet Click both offer superb tactile feedback, and the Click switch adds auditory feedback that coincides with the tactile bump and actuation. Overall, I prefer the sound and feel of the Matias Click switch by a small margin, but if I need silence when typing, the Matias Quiet Click version of the keyboard is the quietest mechanical keyboard I have ever encountered. 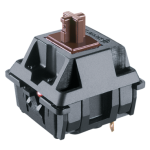 An advantage of premium keyboards such as the Topre Realforce 87u, HHKB Pro 2, or vintage IBM buckling spring keyboards is their stock dye-sublimated PBT keycaps. 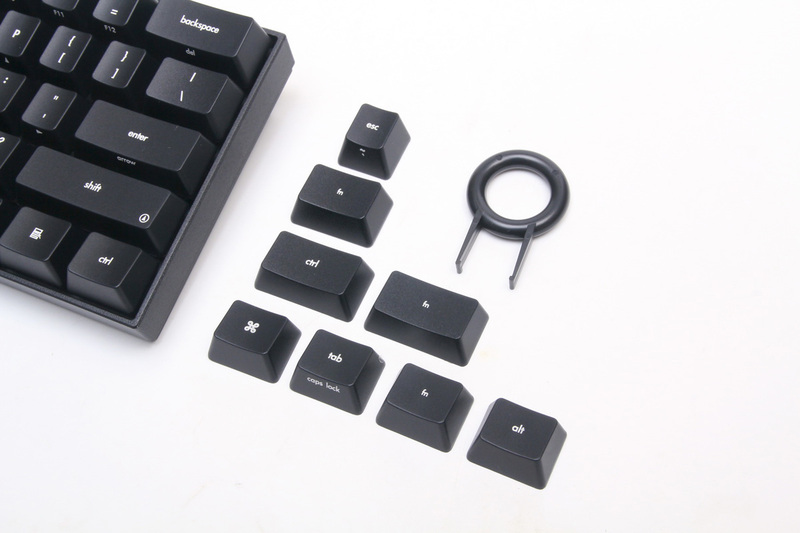 For those who do not like the stock ABS laser-engraved/infilled keycaps on the KBP V60MTS keyboards, the relative shortage of replacement keycaps with Alps/Matias stems is a drawback. 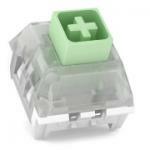 However, at least some replacement keycaps will soon be offered for sale on the Matias web site, and it is possible to source excellent replacement keycaps from certain Alps-compatible keyboards. Overall, I really like the KBP V60MTS keyboards, and I intend to add them to the all-time favorites in my keyboard rotation along with such notables as the IBM XT, RF 87ub 55g, and HHKB Pro 2. My rating would be 5/5, but I gave these keyboards 4/5 only because of the relative lack of replacement keycaps.